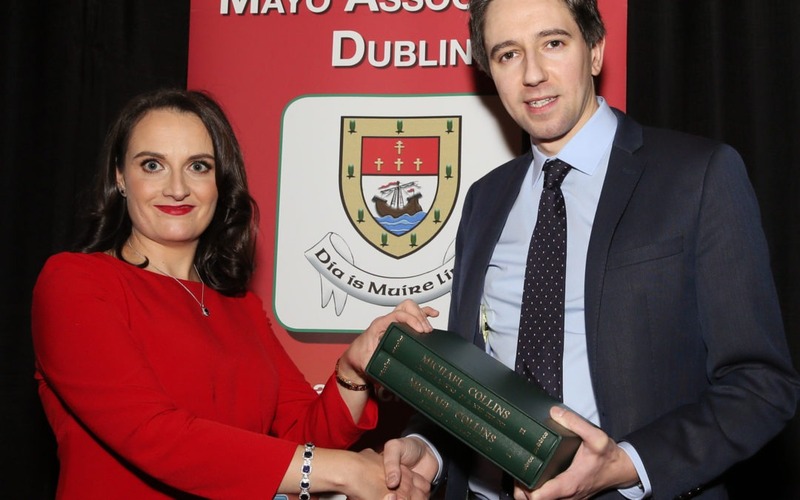 Addressing up to 500 people who attended our Annual Business Lunch at the Intercontinental Hotel, Ballsbridge in November, guest speaker Mr Simon Harris TD, Minister for Health, noted the vital role that Mayo had played in continuing to attract Foreign Direct Investment to Ireland. He said that the presence and commitment of these companies to Mayo was a testimony to the positive economic-focused environment that has been fostered in the county as well as the range of successful indigenous industries in operation throughout the western county. Pictured (l-r): Frank Fleming, Hon. 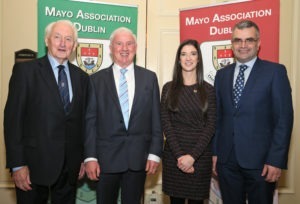 Life President of Mayo Association Dublin; Bernie O’Hara, Mayo Association Galway; Dr Norah Patten, Ballina and Dara Calleary TD. Notable guests who also attended our lunch on Friday 9 November included Damien English TD, Minister of State at the Department of Housing Planning and Local Government; Deputies Dara Calleary and Jack Chambers, Senators John O’Mahony, Catherine Noone and Keith Swanick, Cllr Michael Loftus, Leas Cathaoirleach MCC; Peter Duggan, Acting Chief Executive, MCC; Deirdre Garvey, Chair of the Board of the Western Development Commission; Joe Gilmore, CEO of Ireland West Airport; Cllr Anthony Lavin, Mayor of Fingal County Council; Harry Hughes, EY Entrepreneur of the Year 2017; Ballina’s Dr Norah Patten as well as former ‘Mayo Persons of the Year’ Tommy Griffith, Bill Durkan, Tom Jordan and Frank Harrington. We’re delighted to report that a total of €8,715 was raised at the lunch, which will go towards our annual charity donations, worthwhile causes and initiatives around the county. Thank you to all supporters of our Association for their never-ending support and generosity. Mayo Association Dublin’s Chairperson Julie Doyle made a special presentation to Minister Simon Harris of a book-set on Michael Collins. Pictured (l-r): Frank Fleming, Hon. Life President of Mayo Association Dublin; Bernie O’Hara, Mayo Association Galway; Ballina’s Dr Norah Patten and Dara Calleary TD.